A secondary school in south London has won the UK's most prestigious architecture award. The Evelyn Grace Academy in Brixton, designed by Zaha Hadid Architects, has been given the Royal Institute of British Architects' Stirling Prize. It beat the favourite, the London 2012 Olympic velodrome. Hadid has now won the Stirling for two years in a row. The prize is awarded to the best new European building that has been built or designed in Britain. The other nominated buildings included the renovated Royal Shakespeare Theatre in Stratford-upon-Avon and the Folkwang Museum in Essen, Germany. The Royal Institute of British Architects (Riba) described the £37.5m academy as a "highly stylized zig-zag of steel and glass". Riba president Angela Brady, who chaired the judging panel, praised the way the "imaginative" design was "expertly inserted into an extremely tight site". With a relatively small location and sport as one of the academy's "special subjects", they put a 100-metre running track through the middle of the site, under a bridge between two school blocks. "The Evelyn Grace Academy is an exceptional example of what can be achieved when we invest carefully in a well-designed new school building," Ms Brady said. The annual award is given to the architects of the building that has "made the greatest contribution to the evolution of architecture in the past year". 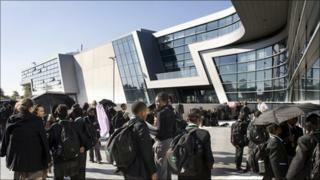 Zaha Hadid's London-based practice won for the Maxxi contemporary art museum in Rome last year. The consecutive victories confirm her as one of the country's leading architects, with the London 2012 Olympic Aquatics Centre, Glasgow's Riverside Museum and plans for the Cardiff Bay Opera House also to her name. Hadid grew up in Iraq before leaving at the age of 17. She has not been back to the country for 30 years but will soon return to design Baghdad's Central Bank - a prospect she describes as "very emotional". She set up her own practice in London in 1980 but the academy was its first major project in the capital. "It's not for me to say why this is the first," she told BBC News. "It's not for lack of trying." She said she believed that architecture could have an impact on behaviour and education. "I think there's no question that the environment impacts on everybody, whether it's schooling or housing or hospitals," she said. "Wellbeing and architecture are connected, there's no question about it." Discussing the philosophy behind her projects, she added: "The most important thing is to inspire people. And that's why schooling and education is the most important [thing]." The academy's principal Peter Walker said students were positive about the building and that it may inspire them to go on to great things. But he added that a beautiful building was of no benefit unless the education was up to scratch. "High standards of behaviour and very high aspirations in terms of academic achievement are at the heart of what we're about, and having an aspirational building supports that drive," he said. "I'm sure there are students who will be inspired to look at design and perhaps at architecture through attending the building, but fundamentally they won't get there unless what we provide in our classrooms is of high quality for their learning." Hadid, who will receive a cheque for £20,000, was in the US and so missed the ceremony at the Magna Science Adventure Centre in Rotherham, which won the prize in 2001. The other shortlisted buildings were An Gaelaras, a cultural centre in Derry, and The Angel Building, a renovated 1980s office block in Islington, London. The prize was set up in 1996 and is named after the late British architect Sir James Stirling. The ceremony will be broadcast on The Culture Show on BBC Two on Sunday.